Complement your favorite chair or sofa with this rustic chairside table. The riveted metal base and natural wood feel add a rugged sophistication to your living area while the top drawer and lower shelving provide storage options within an arm's reach. Your living room is better off with this convenient functionality and rustic charm. 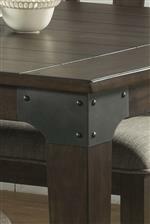 The Whiskey River Rustic Chairside Table with Drawer and Bottom Shelf by Intercon at Gallery Furniture in the Oregon, Portland, Clackamas, Washington, Beaverton, Northwest, Vancouver area. Product availability may vary. Contact us for the most current availability on this product. This collection is for people who appreciate both more ruggedly natural stylings and modern functionality. Each piece features slightly distressed wood and an overall unrefined ambiance that can easily enrich a home with a rural flair. This collection also features consoles and tables with unique storage capabilities that are convenient and perfect for more modern settings. Every home can benefit from the rustic style and useful practicality of this absorbing collection. The Whiskey River collection is a great option if you are looking for Rustic furniture in the Oregon, Portland, Clackamas, Washington, Beaverton, Northwest, Vancouver area. Browse other items in the Whiskey River collection from Gallery Furniture in the Oregon, Portland, Clackamas, Washington, Beaverton, Northwest, Vancouver area.